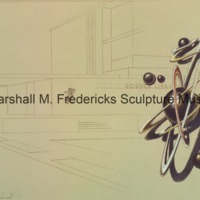 Sculpture Lobby Decoration for Michigan Mutual Liability Company. Possibly unrealized. 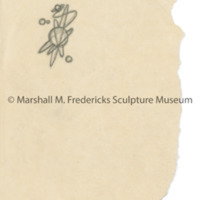 Verso of drawing also contains sketches of planetary spheres for Kresge Science Library. 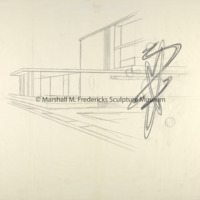 Sketch of planetary sphere for Kresge Science Library, Wayne State University, Detroit, Michigan. Possibly unrealized. 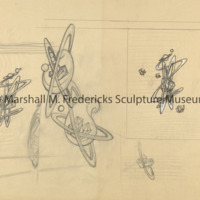 Sketches of planetary spheres for Kresge Science Library, Wayne State University, Detroit, Michigan. Possibly unrealized. 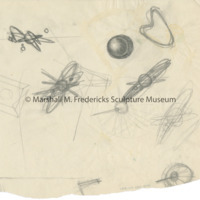 Sketches of planetary sphere for Kresge Science Library, Wayne State University, Detroit, Michigan. Possibly unrealized. n.d., pencil, colored pencil, and watercolor on board, 12 3/8 x 18 3/8 inches. 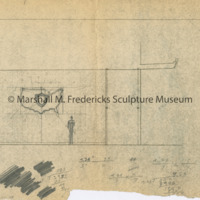 Possibly for Kresge Science Library at Wayne State University, Detroit, Michigan.